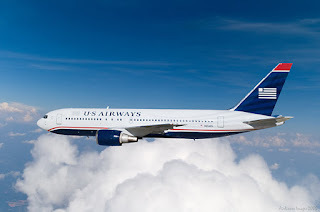 On the flight home from our annual sales kickoff this week, I flew USAir. I flew them because the schedule was convenient. Check out their policy on customer service here. Nowhere in the policy does it say anything about creating excellent customer experiences, or even trying to be pleasant. And boy does their lack of attention to customer experience show. Even though I am now gold level, they do not do much of anything to make me feel special like American used to do. They are not funny like Southwest, or fun like Jet Blue, but they do fly nonstop PHX to BOS, so I put up with it. Seats are hard, flights packed full, and legroom is so skimpy I had to get a smaller laptop to squeeze it in behind the seat in front of me so I could work on the plane. They have successfully achieved their apparent goal to deliver lowest common denominator of US airline customer service. Last Friday, things sank a little lower, and it made me start thinking about the contentedness of customer experience touchpoints, and the great tragedy of one lousy interaction destroying the work of so many. Walking up to the club to wait for my flight, I was feeling good about USAir. In the lounge, the attendant was extremely helpful, checked our flight status without asking, apologized for a delay, and even researched the cause. Walking over to a comfy leather chair in the lounge, I still felt good about USAir - even though the flight was an hour delayed, and I was going to miss a dinner date with Pam when I got home. Finally on the plane, we faced additional delays. When the door finally closed, I pressed the power button on my RazorMax, and laid it face down on the seat waiting for it to shut down. The flight attendant came by checking for compliance, stopped at my row, looked at me, and barked, “Whattaya think I’m stupid? Turn it off.” I sheepishly flipped it over, showed her the splash screen shutting down, and looked her in the eye, expecting, I suppose, an apology. When walked away without a word, I started felling pretty bad about USAir. My seatmate dropped his hand, and looked at me. “I hate this airline,” was all he said. At sales kickoff, we spent a lot of time talking about customer experience. We heard Nicholas Webb speak about the efforts great companies like In ‘N Out Burger, and Southwest Airlines put into ensuring every customer touchpoint is aligned, coordinated, and exceptional. He uses the vivid expression – creating delicious experiences. And here was a vivid example – of how NOT to do it. Everyone who works at USAir – all the baggage handlers, agents, pilots, mechanics, marketing teams, cleaning crews, everyone – was shafted Friday by one lousy customer touch point – one grouchy flight attendant ruined all their hard work that week. One simple little touch point collapsed USAir’s house of customer experiences for both my seatmate and me. Why was she rude? – union rules, overworked, tired, poor hiring, poor training, or perhaps because she herself is treated like crap by her employer? Does not matter. There is no excuse. Her failure brought down the system, and it was an incredible, avoidable waste. Customer service is everyone's job, at every touchpoint, every time. I'll probably fly USAir again - but I am going to take a long hard look at JetBlue next time. Even though the schedule is not as convenient, they still smile once in a while, and they don't use those damn carts anymore.